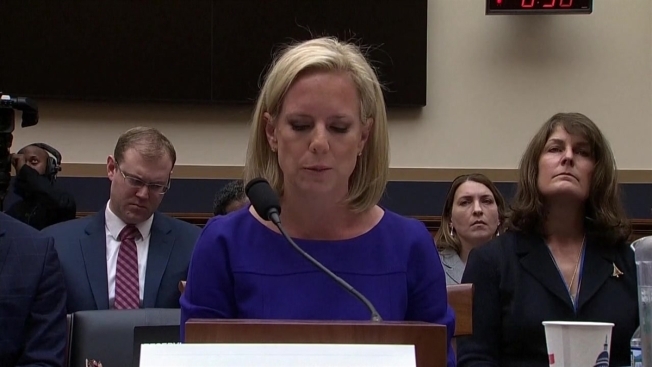 Homeland Security Secretary Kirstjen Nielsen faced a barrage of criticism from House Democrats on Thursday in a testy hearing on the Trump administration's immigration policies, NBC News reported. In one particularly heated exchange during the House Judiciary Committee hearing, Democratic Rep. Luis Gutierrez of Illinois called the DHS chief a liar after she defended the administration policy of separating migrant children from their parents at the U.S.-Mexico border. "It is as if you can’t see the reality of modern immigration or contributions of anyone who came from countries other than Norway or other parts of Europe. It’s as if you and the Trump administration are blind," he said. "Shame on everybody that separates children and allows them to stay at the other side of the border fearing death, fearing hunger, fearing sickness. Shame on us for wearing our badge of Christianity during Christmas for allowing the secretary to come here and lie." Nielsen has been under intense scrutiny from lawmakers and the public over the past months for enforcing the administration's staunch anti-immigration policies. President Donald Trump has also reportedly expressed displeasure with her job performance.